As a photographer I hate to admit it, but I’m horrible when it comes to picking colour schemes. I know what I don’t like – it’s easy for me to conclude that a colour is too warm or cold, that I’d prefer a darker shade, or that the saturation just doesn’t cut it. But ask me to help choose a colour palette for a web site, and I’m in trouble. 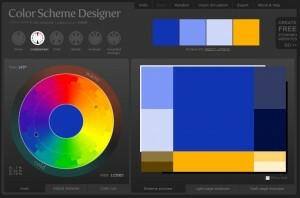 Over the weekend while searching for some help, I ran across this gem: Color Scheme Designer. It’s a free web-based application that allows you to choose a hue, adjust saturation, brightness, contrast and other options to develop your killer colour scheme. When you’re done, you can click on the “Scheme ID” (look for it on the right under the four colour squares) to obtain a URL to your new scheme – perfect for sending to friends, colleagues and web designers for their opinion. Thanks to Petr Stanicek for this excellent tool! This entry was posted in Resources, Tips by Eric. Bookmark the permalink. That blue/yellow scheme in the example picture are the colours of my old public school.